The Brocade VDX 8770 Switch is a highly scalable, low-latency, 1/10/40/100 Gigabit Ethernet (GbE) modular switch. Designed to easily scale out Brocade VCS fabrics, the Brocade VDX 8770 Switch brings new levels of performance to VCS fabric deployments. Designed to scale out Brocade VCS fabrics, the Brocade VDX 8770 Switch supports complex, highly dynamic environments with dense virtualization and extensive automation requirements. The Brocade VDX 8770 is a highly scalable, low-latency 1/10/40/100 GbE modular switch, available in both 8U four-slot and 15U eight-slot versions. The Brocade VDX 8770 Switch is designed to scale out Brocade VCS fabrics and support complex environments with dense virtualization and dynamic traffic patterns—where more automation is required for operational scalability. 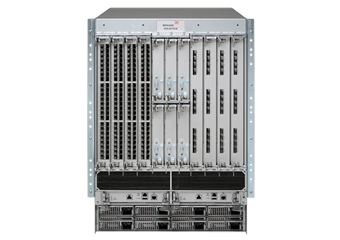 Available in four-slot and eight-slot versions, the Brocade VDX 8770 provides a highly scalable, low-latency 100/40/10/1 GbE modular switch. VCS Logical Chassis, self-forming and self-healing fabrics, and AutoFabric Provisioning simplify operations and streamlines configuration. Fabric-level REST APIs allow higher-level management frameworks to provide efficient orchestration of VCS fabrics within a cloud context. The single point of management eliminates the need to manually configure and manage each switch, simplifying management, lowering operational costs, and reducing configuration errors with the ability to push software upgrades across the fabric with a single command, accelerating deployment. Optimized east-west traffic and multipathing across Layers 1–3 create a flexible network that adapts to changing business conditions and traffic patterns. A variety of features supports VM mobility and eliminates the need to manually configure port profiles. Brocade VCS Gateway for NSX unifies virtual and physical architectures while the VCS Virtual Fabric feature provides secure multitenant support. The Brocade VDX 8770 Switch operates seamlessly under the Brocade Vyatta Controller. This controller is a quality-assured edition of the OpenDaylight controller code supported by an established networking provider and its leaders within the OpenDaylight community. Older, legacy data center networks are characterized by a rigid hierarchy with access, aggregation and core layers. This model does not allow for changing traffic patterns and limits network utilization. It has limited support for server virtualization and cannot facilitate operations such as VM mobility. Compared to classic hierarchical Ethernet architectures, Brocade VCS Fabric technology creates a more efficient and resilient network with a flat-meshed Layer 2 topology that delivers the high performance and high reliability required by data centers. Organizations gain a more flexible network that helps them rapidly adapt to changing business conditions and traffic patterns. Compared to classic Ethernet architectures, Brocade VCS Fabric technology allows all paths to be active and provides greater scalability—while reducing management complexity. Small-scale VCS fabric: Collapses access and aggregation tiers using the Brocade VDX 8770 as a port-dense, middle-of-row/end-of-row access switch. Medium-scale VCS fabric: Utilizes the Brocade VDX 8770 as a spine switch in combination with Brocade VDX 6710, 6730, and 6740 leaf switches to build highly scalable Layer 2 domains, complete with automatic and secure support for VM mobility. Large-scale VCS fabric: Uses the Brocade VDX 8770 homogeneously as both a leaf and spine switch or to aggregate multiple access-tier switches in full or partially meshed fabric domains with a logically flat network topology.